Shopping for appliances online can be an intimidating experience. Blogger Mandi Johnson of Making Nice in The Midwest purchased all of her new kitchen appliances online for her home. Read on to find out how easy her shopping experience was. Planning a kitchen renovation has been a dream come true for me! The process has kept me up at night in the best way, dreaming of tile options, lighting fixtures, and color combinations. But when it came to new appliances for our kitchen renovation, I knew what I wanted and was happy to find appliances of my dreams at The Home Depot! The first thing we did during our renovation was rearrange our existing cabinetry to relocate the stove to a spot where it could be the focal point of the kitchen. While our kitchen isn’t as big as some, we do cook frequently and host large gatherings in our home, so we knew we would want to fit in a 36-in. commercial range with 6-burners and a large oven. I browsed all of the oven choices at The Home Depot online while I was working on my kitchen floor plan, and immediately the KitchenAid 36-in. commercial-style range jumped out at me because of it’s beautiful design. 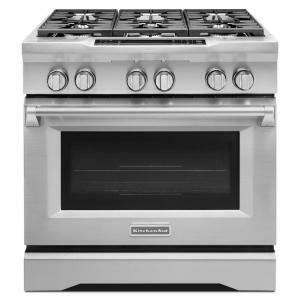 After I began reading the specs of, I was impressed with the 5.1 cubic feet dual range oven that can even steam roasts and bread with the steam assist technology! After talking with a friend who owns this same model and loves it, I knew it was the one for me. I can’t wait to put this baby to use during the holidays! I enjoy online shopping partially because of being able to burn the midnight oil in the comfort of my own home while obsessing over my options. But also, I love being about to read other customer reviews. It takes away any of my shopping anxiety, and is especially helpful when you’re about to make a very big purchase, like new kitchen appliances. After deciding on my range, I looked for well-reviewed hood vents that had simple controls and a sleek design for its underside. I knew I wanted to build a box around the hood vent, so I was really only looking out for those two factors as far as looks are concerned. 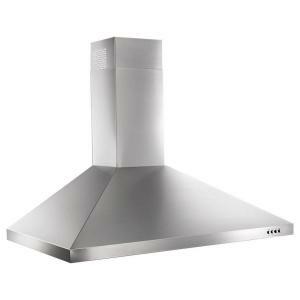 I chose this contemporary Whirlpool hood vent in stainless steel to match the range, and it’s been very easy to keep clean with stainless steel polish. Because I wanted the stove to stand out as the jewel of our kitchen, I began looking for a refrigerator and dishwasher that would blend in with our kitchen walls and cabinetry. The KitchenAid refrigerator that caught my eye has a sleek white design with etched stainless steel handles that make the refrigerator feel very high-end. Its simple design allows it to fit in nicely with my white kitchen. The handles add a sophisticated element to this area. They also tie in with the design of our KitchenAid range. I love that the ice and water features are inside of the refrigerator. Now they aren’t an unwelcome visual feature of my kitchen design. The most important factor in a refrigerator to me was a dual combination of a space-saving footprint without sacrificing storage capacity. Refrigerators can be bulky and protrude awkwardly from their space between cabinetry. My refrigerator’s placement made this even more of an issue for me. A standard refrigerator would block the adjacent door. Happily, the fridge that caught my eye design-wise also worked with my space constraints! It’s so efficient with storage. I can store my milk and juice in the generously sized door shelves. The deep meat and cheese drawer has been a surprisingly spacious spot that feels like bonus storage. As far as freezer storage goes, it’s really easy to keep things organized and easily visible. I used to lose track of a lot of what was in my freezer. With the separate top and bottom drawer sections of this freezer, that’s not a problem any more. After falling in love with our KitchenAid refrigerator and range selections, the dishwasher really became sort of an after thought. 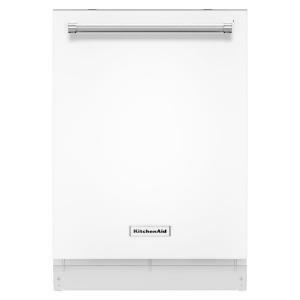 I chose this KitchenAid top-control dishwasher because it matched the refrigerator and had good reviews. But after it was installed, I was really delighted at how nice it really was. The trays glide so easily. Regardless of how I arrange dishes and pans inside, things always seem to fit so well. Most importantly, this dishwasher is the first one I’ve owned that has really produced completely dry, spotless, gleaming dishes at the end of a cycle. We love it and feel much less pressure to scrub and rinse dishes before running them through the dishwasher. I also love that the controls for the dishwasher are out of sight. The unit looks very streamlined and in keeping with the style of the kitchen design. I can interrupt a cycle and press the resume button if need be, and there are a lot of options for various types of cycles. I can run through a small or large load and only use as much water as we need. The etched stainless steel handle doesn’t show smudges, and is easy to clean. It’s also a bonus for me that it provides a handy place to drape a dish towel, without damaging my cabinetry or looking sloppy. 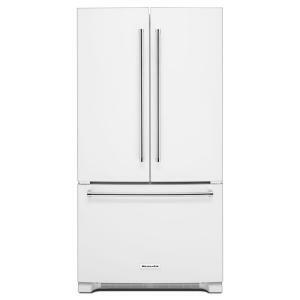 I did all of my appliance window shopping online, but was a bit nervous about pulling the trigger on my refrigerator choice. I was concerned about storage space. So I popped in at my local Home Depot, and was happy to see the model I wanted in the kitchen showroom. I saw that the refrigerator was exactly what I wanted and needed. Then, I returned home and finalized my decisions after double checking all of my options again online. I ordered my appliances and selected a delivery and installation date, and the rest is history! Now that we’re finalizing the details of our kitchen renovation, I can’t imagine having any other appliances in this space. They really do make the room! Everyone who comes over raves about our kitchen. I can’t wait to begin hosting large family-style dinners in our home. Find more kitchen appliances online at The Home Depot. Learn more about The Home Depot appliance shopping experience on The Home Depot Blog.